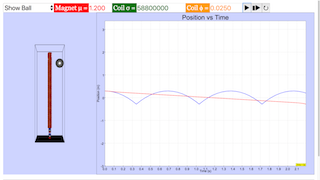 Toggling the combo box will set the display of the simulation. 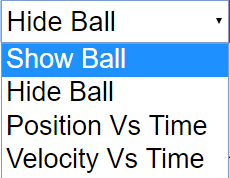 Choosing between Show/Hide Ball will toggle the visibility of the ball. set which graph to display. Toggling the Magnet u field box will set the magnet's strength. Toggling the Coil sigma will set the coil. Toggling the Coil phi will set the coil size. Plays/Pauses, steps and resets the simulation.